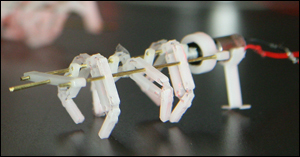 This "crab-bot" in Bergbreiter's lab is an example of a microrobot with legs. Assistant Professor Sarah Bergbreiter (ME/ISR) is the recipient of a 2011 National Science Foundation Faculty Early Career Development (CAREER) Award for "Microrobot Legs for Fast Locomotion over Rough Terrain." The five-year award is worth $400,000. Bergbreiter will create legs that will enable microrobots to walk, and even run, over rough terrain. She will model viscoelastic microrobot legs in a dynamic simulation environment and experimentally validate the models using a new microfabrication process that includes viscoelastic materials. This work will lead to the first sub-centimeter robots that can move quickly over complex surfaces, in addition to a wealth of data to enhance understanding of insect locomotion. Insects like cockroaches use control mechanisms embedded in their legs to prevent them from tipping over at high speeds. These same ideas can be ported to microrobots by using viscoelastic materials for dynamic stability control. Specific innovations will include parameterized models for microrobot legs, fabricated artificial insect legs with tailored compliance and damping, and integration with actuators to test the microrobot legs on different surfaces. Microrobots that move through real-world environments at insect-like speeds can search through small cracks in rubble after natural disasters, provide low-cost sensor deployment over civil infrastructure, and engage in stealth surveillance. In addition, robust, viscoelastic mechanisms similar to these legs can provide breakthroughs in applications such as minimally invasive surgery and micromanufacturing. The NSF CAREER program fosters the career development of outstanding junior faculty, combining the support of research and education of the highest quality and in the broadest sense.